Today in Masonic History José Eloy Alfaro Delgado passes away in 1912. José Eloy Alfaro Delgado	was an Ecuadorian revolutionary and politician. José Eloy Alfaro Delgado, more commonly referred to as Eloy Alfaro, was born in Montecristi, Ecuador on June 25th, 1842. He was educated in his hometown. After graduating he helped his father with business negotiations. He also aligned himself with anticlerical liberalism. After Alfaro's passing the doctrine would be used to as the basis of the Ecuadorian Radical Liberal Party. Alfaro would fight against many different presidents of Ecuador, both political and all out fighting. In Ecuador there is a long history of liberals fighting against conservatives. All of his fighting gave him the nickname "Viejo Luchador" (Old Warrior). During much of his life Alfaro found himself in exile in Panama. Generally returning to fight a new battle in the cause of liberalism. During at least one of his exiles he sold traditional toquilla hats in Panama to tourists. Since many of the tourists believed that the hats were made in Panama, the hats became what are now known as Panama hats. In 1895, in a coup d'etat, the liberals finally seized power. 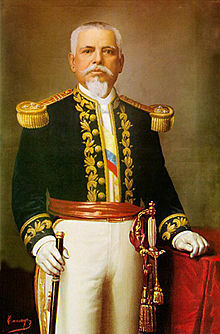 Alfaro deposed the sitting president and declared himself dictator. Two years later he would be named the constitutional president. His principal accomplishment during his term was bringing secularism to Ecuador. He would leave office in 1901. By 1906, Alfaro deposed his successor, a man he had initially supported. During his second presidency he made far more changes then in his first presidency. He enacted Freedom of Speech laws, legalized civil marriage and divorce, constructed public school, inaugurated the right to a free and secular education and completed the Ferrocarril Transandino (Trans-Andean Railroad). He also tried to secularize Ecuadorian society by seizing church property, expelling religious orders and prohibiting the establishment of new monasteries and convents. Some time around or before 1911, Alfaro had become unpopular with his own supporters. He fled again to Panama. On August 12th, 1911, he resigned the presidency hoping to avoid open fighting. In late 1911 he returned to Ecuador and was arrested. He was ironically brought to the capital on the very train he helped to complete. On January 28th, 1912, a group of pro-Catholic soldiers broke into the prison where Alfaro was jailed with others. The soldiers were shouting "Viva la religión y mueran los masones" (Long live religion and death to the Freemasons). Alfaro and others were dragged down the cobblestone streets and most died, including Alfaro, long before they were hung up in the town square. Eventually the soldiers burned the bodies. Alfaro's remains were later, in secret, removed and buried at an undisclosed location. Alfaro is believed to have received his degrees in Lima, Peru. In 1911 he joined Rosa de América Lodge in Panama. During the 1912 unrest in Ecuador the Grand Lodge of Panama memorialized Alfaro for having "displayed the spirit of Masonry in his struggle to implant the ideals of progress in his mother Country” and leaving “an interminable trail of Light”.